Celebratory golden collection to be showcased around the country. Honda Australia and its motorcycle division are celebrating 50 years since the Japanese manufacturer established itself locally in the country with a series of gold motorcycles, cars and power equipment, including the CRF450L and CRF50F. 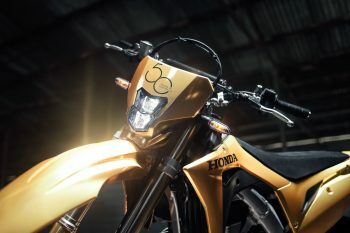 Although Honda products had been imported and distributed around Australia by a variety of private companies since the 1950s, the brand’s official local presence began when Honda Motor Company in Japan sent Hidehiko Shiomi to Melbourne to set-up a unified, national representation for Honda in Australia.